The recently signed “Next Generation Energy Act of 2007 is a Minnesota state initiative stepping-up the state’s commitment to renewables in the form of bioenergy, hydrogen, hybrids, solar energy and other alternative technologies currently under development. One such technology alternative under development is a controversial “dark horse” candidate yet to be verified, but if proven true could open the way to accelerating our state’s standing in renewable electrical power production. You may have heard about “Steorn Ltd.”, the small Irish technology management firm behind Orbo, a magnetic “free-energy” technology. 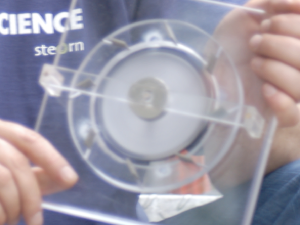 Steorn claims that it has the potential to reduce dependence upon fossil fuels by making possible carbon-neutral power generated from the interaction of magnetic fields. If true it could change how we power our mobile electronics, vehicles… even our homes. Steorn won’t be developing products themselves but will be licensing their technology to all interested parties. Generators would be produced by third parties under a modified “general public license”. Steorn is also preparing an online instructional Knowledge Base to assist early adopters in understanding their technology. This is my fourth story on Steorn since last August. Steorn first drew my attention after they placed an ad in The Economistchallenging the scientific and engineering communities to join a “jury” to prove their technology false. Steorn has continued to work with their jury and promises a demonstration next month in London. A demonstration is a necessary-but-not-sufficient step that may generate more questions than answers. Claims of free-energy and “over-unity” motors are quite common on the Internet, though no such technology has ever been independently confirmed. The blogosphere is replete with discussions about Steorn’s claims. Opinions range from it being a hoax or an “alternative reality game”, to those who compare it to the “social mechanics and goals of utopias”. If the science behind Orbo is verified and its implementation found economically viable for the production of electricity, it could lead to electric vehicles that never need recharging from the existing power grid and homes that generate much of their energy needs. If Orbo-based generators are successfully put into production how could Minnesota and its communities take advantage of this technology? The Next Generation Energy Act propels Minnesota as one of two top states (with California) in the U.S. leading the way towards reducing greenhouse gas (GHG) emissions. It includes overhauling the state’s Community-Based Energy Development statutes and creating incentives for communities that invest in renewable power. It gives greater weight to local energy cooperatives and will help the state reach its Renewable Energy Objective (REO) goal of providing 25% of all electricity through renewables by 2025. Orbo could play a part in achieving those goals. Orbo’s renewable technology reportedly scales from use in mobile consumer electronics up to generation of power for industrial applications. In its “mid range” of capabilities it has the potential to replace automotive powerplants and provide electrical power generation in the home. Though renewable energy is available for urban residents, home generation would eliminate long distance transmission issues encountered when powering urban homes with rurally produced wind farm energy. The energy output from Orbo technology is reportedly constant, unlike the intermittent outputs typical of solar or wind generation. This means less need for storing that energy and more opportunity to sell excess power back to existing utilities. Orbo generators could even be employed to create local neighborhood electricity cooperatives. With generators of sufficient capacity local cooperatives could form the basis for “hyperlocal” neighborhood power grids. Hyperlocal power grids would have some unique advantages beyond just eliminating transmission issues. They could provide local emergency power during outages and offset local peak demand in sweltering summer months. They could also accommodate a neighborhood’s ad hoc needs – from increasing street lighting levels during a rash of burglaries to supplementing park lighting for night softball games or theater-in-the-park. When control over supplemental power is local then the benefits — in terms of property values, amenities and safety — are also local. Minneapolis has already taken the lead in connecting its citizenry to other local technology grids. Neighborhood wireless “nodes” are currently being installed and networked into a citywide “muniwireless” grid. When completed later this year it will provide all neighborhoods with equitable access to the Internet as well as direct connectivity to others in your neighborhood. In the metro area Minneapolis is not alone. Suburb St. Louis Park is planning a similar wireless installation and the city of St. Paul is also engaged in discussions. Wireless access has been recognized as a “common good” facilitating the connectivity of residents and strengthening neighborhoods. Renewable power grids within urban neighborhoods could also be viewed as a common good. Such grids have never before been developed in cities, largely because of the lack of a suitable renewable technology. Renewable solar photovoltaic installations are found within neighborhoods but are costly to install per kilowatt returned and their output is relatively modest. Wind power generation is similarly a renewable technology but turbines suitable for residential installations are still being developed and would also incur high capital investments for installation. An ideal neighborhood power grid composed of home generators must meet certain criteria for effectiveness. They must be cost competitive with utility rates, use technologies that are congruent with building codes, minimally change architectural aesthetics and have installation costs low enough that returns can be realized by home owners. Assuming Steorn’s projections about potential generator power density (half a watt per cubic centimeter… about that of laptop computer batteries) are reliable and material costs are low, Orbo becomes a viable candidate. Generators could be installed in basements and connected to home electrical systems with little modification. Installation of isolation switches (to switch off power when grid maintenance is being performed) would be one of the few changes required. Turn it on and your electric meter begins to run… backwards! Imagine a residential community with 100 percent carbon-neutral energy usage. Neighborhood power grids employing Orbo-based generators in every home could provide most energy needs. Since these generators output power 24/7 the excess electricity generated could be sold back to the utility power grid. Some of those proceeds could be used to purchase and install additional carbon-neutral generators connected to the neighborhood power grid. Future legislation might also allow Orbo-based generator owners to accrue and sell carbon credits for their carbon-neutral power production, thus creating another stream of revenue that could seed new generator purchases while improving the community’s carbon account. Another benefit would be supplementing other carbon-reducing technologies. Even the newest technologies for reducing or sequestering carbon emissions require power that (hopefully) would be from renewables. In either the “extraction of carbon dioxide from air” or the “catalytic generation of hydrogen”, the processes require power for recovering materials lost in the extraction chemistry. That power should be generated through renewables such as Orbo technology. A carbon-neutral community could utilize local technical colleges and service shops to engineer and perform vehicle conversions from hybrid and plug-in hybrid to Orbo-assisted hybrids or full electric vehicles (EVs). Such vehicles would be capable of generating a trickle charge to batteries, keeping them constantly charged while operating. When parked at home such hybrids or EVs might even be able to utilize their constant power output for the neighborhood power grid. Orbo-assisted EVs would eliminate reliance upon daily recharging from the existing electrical grid, which is mostly supplied by coal or natural gas fired plants. And the electrical demand imposed by recharging EVs would be high. It is estimated that having just 3 percent of vehicles in the metro area run on all electric power would require seven times the planned capacity of regional power utility Xcel Energy’s Windsource renewable wind turbine farm1. Finally, generators could also be employed to refrigerate cold storage spaces, using them to buffer swings in energy demand and to supplement air conditioning usage in the summer. Excavated and natural underground caves used for cooling are currently employed in Europe. Local versions could be excavated within sandstone or limestone bedrock. Perhaps the site of the soon-to-be decommissioned Ford Motor Company’s Twin Cities Assembly Plant in the Highland Village neighborhood of St. Paul could be utilized as the first site for such a community. Appropriately, the site has a history of automotive technical expertise. That history could be continued by creating a small facility for converting hybrids to Orbo-assisted hybrid technology. Bedrock under the Ford plant is also honeycombed with tunnels excavated decades ago when Ford used the silica-rich sandstone for making windscreen glass. Converting some of that underground space for energy storage in the form of cool air reservoirs could be accomplished with the carbon-neutral generators. Before development plans for the Ford Plant are finalized it would be worthwhile to study the possibility of such a new community design. It would be the first such development in the country and might serve as an example in planning, development and education for the rest of the world. Earlier this year the governor signed legislation appropriating $17 million for energy research, including funding for the University of Minnesota’s Initiative for Renewable Energy and the Environment. If Steorn’s technology is independently verified then the University should consider utilizing some of this funding to bring together visionaries, technologists and public policy advocates in sustainable energy, transportation and architecture to explore this new technology’s potential. We will all be watching Steorn to see if this technology performs as claimed and passes the critical peer review that it must in order to be taken seriously. But that should not deter us from getting an early start on discussing the “what if” implications for such an important potential. As a state… as a community… a willingness to withhold criticism on formative ideas until they can reach maturity is a small risk that will predispose Minnesota to capitalize upon opportunities that other states recognize only years later. 1 “Windsource capacity” as reported by Xcel Energy and assuming a max. Four-hour recharge time from household (110V 20A) circuits for 3 percent of the Minneapolis/St. Paul metro area “CTPP2000” vehicle count.